Hmm, that name sounds familiar. Oh, wait, that's me! lol Sorry guys, don't hate me, I just couldn't resist! I finally revealed the cover for my book last week and I'm so excited!! I've had so many great comments from so many wonderful people, but I think my favorite was from my pal Molli: "I adore the cover, from the text and swirls around the title, to the actual picture. Everything about it is lovely and a little wistful. Good choice and great design!" You made my day, Molli, thank you! 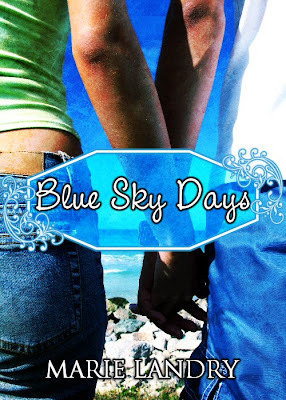 To find out more about Blue Sky Days, check out the book's GoodReads page. I think this cover is absolutely gorgeous. There's another version of it that's pretty but really plain, and this one is just so beautiful. I love the girl, the font, the flower, the accents around the title, the colours, everything. Synopsis: The Victorian language of flowers was used to express emotions: honeysuckle for devotion, azaleas for passion, and red roses for love. But for Victoria Jones, it has been more useful in communicating feelings like grief, mistrust and solitude. After a childhood spent in the foster care system, she is unable to get close to anybody, and her only connection to the world is through flowers and their meanings. Now eighteen, Victoria has nowhere to go, and sleeps in a public park, where she plants a small garden of her own. When her talent is discovered by a local florist, she discovers her gift for helping others through the flowers she chooses for them. But it takes meeting a mysterious vendor at the flower market for her to realise what's been missing in her own life, and as she starts to fall for him, she's forced to confront a painful secret from her past, and decide whether it's worth risking everything for a second chance at happiness. "The Language of Flowers" is a heartbreaking and redemptive novel about the meaning of flowers, the meaning of family, and the meaning of love. What do you think of this cover? Have you read this book? Oh, I've not seen this cover before. I like it, its very delicate. The colors are soft and I like the subtle tones. The girl holding the photograph of a flower adds an extra seductive touch. And this one is VERY opposite of your cover which has very bright and almost HDR like images and tone. Total opposites for sure. I'm a sucker for anything with Polaroids and yours is so pretty and blue! Congrats! Hehe nice plug for your book there. Very subtle! ;) The Polaroid on the second cover is a nice touch. Me like! 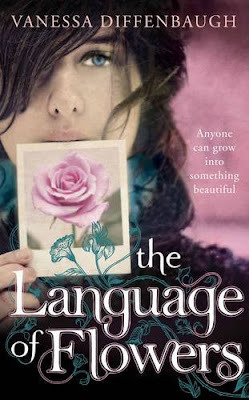 I love the title font and accents for Language of Flowers. Very pretty.